A crime boss, crime lord, kingpin, gang leader, or crime leader is usually a person in charge of a criminal organisationand has absolute, or near absolute, control over his or her subordinates and profits from the criminal endeavours in which their organisation engages. Some groups have a complex, structured organisation with many ranks, while some may only have as little as two ranks (a boss and his soldiers). In other cases, for example in the case of criminal gangs in inner-city neighbourhoods in the US, the organisational structure of the gang is just like the restaurant McDonald's because the guys who are running it, the local gangs, are the entrepreneurs who get the exclusive property rights to control the drug-selling (Levitt and Venkatesh 2000). A recent survey by Egley and Howell (2011) estimated that there are 28,100 gangs active in the US, employing some 731,000 individuals. There are clearly many definitions of criminal leaders and of criminal organisations. In this column, we focus on the impact of criminal leaders on juvenile crime. Although it is widely acknowledged that offending during adolescence is likely to occur in the presence of peers (Warr 1996), there has been increased interest in understanding the roles of young offenders as leaders or followers in group offending (e.g. Reiss 1988). This distinction between leaders and followers in adolescent offending is important, as research has shown that a small number of high-rate offenders who are identified as criminal recruiters – roughly 4% of antisocial individuals – are responsible for more than two thirds of their co-offenders’ first-time convictions (Reiss and Farrington 1991). We present a model in which each delinquent decides how much crime effort to exert. The objective function of each individual related to the criminal leader has two key aspects. First, the proceeds from crime depend on a learning effect on how to commit crime that each individual obtains from the criminal leader in the network. Such a learning effect translates into an improvement of the technology of crime to individuals, but this technology decreases with the distance to the leader in the network. Second, because of a conformity effect, each delinquent wants to minimise the (social) distance between his or her criminal behaviour and that of the leader, so that the closer he or she is to the leader in the network, the higher is the influence of the leader. In other words, each delinquent loses utility from failing to conform to the leader's criminal behaviour, and this cost is higher the further away the delinquent is from the leader in the network. We consider a two-stage model where, in the first stage, each individual decides whether to become a criminal and, if he or she chooses to do so, he or she decides how much crime to exert in the second stage. We show how the distance to the criminal leader affects both the decision to become a criminal (extensive margin) and the number of crimes thereafter committed (intensive margin). We test our theoretical predictions using data from the National Longitudinal Study of Adolescent to Adult Health (Add Health) in the US, which contains information on all students attending a random sample of US high schools in 1995. This dataset provides unique information on friendship networks by asking students to nominate up to ten friends from a school roster. It also contains detailed information on juvenile delinquency, including 12 types of crime. To identify criminal leaders in a way that is exogenous to the network formation process, we define a criminal leader as a teenager who has a level of crime more than three standard deviations above the median in the school. The distance to the leader is then calculated by using the (shortest) distance between any delinquent and the leader in the social network to which he or she belongs. Our identification strategy is based on the fact that students choose their friends, and maybe the friends of their friends, but not beyond. The question we study in the empirical analysis is how being (randomly) located at a certain distance to the leader affects an individual's criminal activities. Figure 1 reports the correlation between the distance to a leader and crime activities in the raw data. The figure shows the average crime level for individuals at different path lengths from the leader, highlighting the unambiguous negative correlationbetween crime and the distance to a leader. Results from our analysis indicate thatthe longer the (social) distance to the leader, the lower the criminal activity of a delinquent and the less likely he or she is to become a criminal. 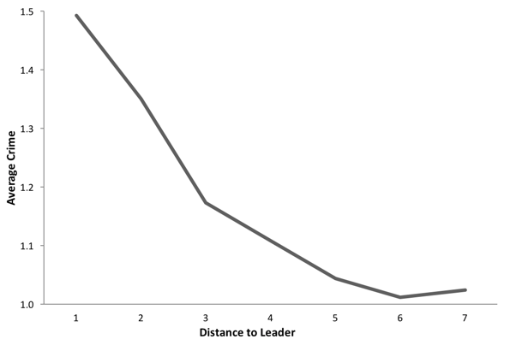 Interestingly, even leaders at a distance of seven nodes from a delinquent still affect the latter's criminal activities, although the effect is weaker than that for someone located closer to the leader. In terms of magnitude, for each one node increase in distance (i.e. one link away from the leader), the total number of crimes committed by each student decreases, on average, by 0.2 units (about 10% of a standard deviation). We then simulate the effects of a policy aiming to remove all criminal leaders from a school. We show that this policy can, on average, reduce crime by 20% and decrease the individual probability of becoming a criminal by about 10%. Our results suggest that criminal leaders are important determinants of criminal activities. In other words, being socially close to leaders matters. As a result, targeting criminal leaders that are socially connected to other criminals could be an efficient policy for reducing crime. Other researchers have suggested that targeting the so-called key playersin social networks could be another effective policy for reducing crime (Ballester et al. 2006, 2010, Zenou 2016, Liu et al. 2018). Key players are delinquents who, once removed from the network, generate the highest reduction in crime. They are characterised by their centrality (or position) in the network (known as ‘intercentrality’). The key player policy, however, is based on peer effects and the key player is the individual who reduces these peer effects the most. In this study, we voluntarily abstract from general peer effects and focus instead on an extreme peer, namely, the criminal leader. Contrary to the key player policy, where the person targeted is the individual who has the highest intercentrality, our study suggests that key players could be defined as the most active criminals who have a considerable social influence in a network (i.e. the ‘key leader’ policy). In other words, according to our results, the most active delinquents who have high closeness centrality should be targeted. In our dataset, key leadersare not always key players, which implies that the two policies are distinct and capture different aspects of criminal activities. Indeed, the removal of key (criminal) leaders leads to an average reduction in criminal activities of about 20%, or a 33% fall for those one link away. This sharp reduction in crime mostly occurs for those less than four links away from the key leader. As a result, in a dense network where the key leaders are at most four links away from all the other agents, the removal of key leaders is effective at reducing crime. Ballester, C, A Calvó-Armengol and Y Zenou (2006), “Who's who in networks. Wanted: The key player,” Econometrica 74: 1403-1417. Ballester, C, A Calvó-Armengol and Y Zenou (2010), “Delinquent networks,” Journal of the European Economic Association 8: 34-61. Egley, Jr, A and J C Howell (2011), “Highlights of the 2009 National Youth Gang Survey,” OJJDP Juvenile Justice Fact Sheet, U.S. Department of Justice. Levitt, S D and S A Venkatesh (2000), “An economic analysis of a drug-selling gang's finances,” The Quarterly Journal of Economics 115: 755-789. Liu, X, E Patacchini, Y Zenou and L-F Lee (2018), “Who is the key player? A network analysis of juvenile delinquency,” Unpublished manuscript, Monash University. Reiss, A (1988), “Co-offending and criminal careers,” in N Morris and M Tonry (eds), Crime and Justice, University of Chicago Press, pp. 55-68. Reiss, A and D P Farrington (1991), “Advancing knowledge about co-offending: Results from a prospective longitudinal survey of London males,” The Journal of Criminal Law and Criminology 82: 360-395. Warr, M (1996), “Organization and instigation in delinquent groups,” Criminology 34: 1l-37. Zenou, Y (2016), “Key players,”, in Y Bramoullé, B W Rogers and A Galeotti (eds), Oxford Handbook on the Economics of Networks, Oxford University Press, pp. 244-274.